HealthCare4All Recommend The Best Products That Keep Your Teeth Healthy & Clean! We all want a lovely smile, with clean straight teeth, and a mouth that’s healthy and fresh! Maintaining good oral hygiene is one of the most important things you can do for your teeth and gums. Healthy teeth not only enable you to look and feel good, they make it possible to eat and speak properly. Good oral health is important to your overall well-being. The Main causes of Gum disease and tooth decay are mainly plaque and tartar build up. Good oral hygiene helps to prevent or delay dental erosion. Your dentist or hygienist can show you how to practice good oral hygiene techniques and can help point out areas of your mouth that may require extra attention during brushing and flossing. So this week, I want to show you some of the best products that HealthCare4All recommend for you to keep your Teeth and mouth healthy and clean! When it comes to choosing between a manual or electric toothbrush, it’s a personal choice – they’re equally effective at removing plaque and debris if used correctly. Both types need to be kept in tip-top condition. Over time, bristles become frayed and worn, so remember to replace the toothbrush or brush head every three months. A rechargeable or battery electric toothbrush appeals to all ages and it’s a real winner for young children. While the kids are attracted to the bright colours, the electric motion of the toothbrush does the job effectively. 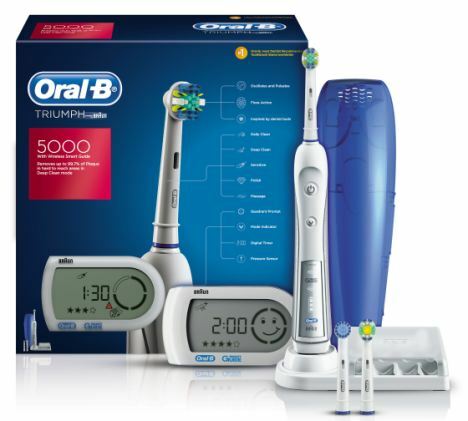 This is no ordinary toothbrush: the huge box it comes in contains a unique wireless Smart Guide device that connects to the brush wirelessly and monitors your brushing. It then gives you a dentist-like report on how you brushed and how you should be brushing to remove all that plaque. It has a timer on it so you monitor length of brush. It even documents the pressure with which you apply it to your teeth. If you put excessive pressure on your teeth, the red pressure sensor light appears. It has several brushing modes including deep clean, whitening and massage. It also comes with a handy travel case and a wall mount so you can position your SmartGuide on the wall next to your bathroom mirror. For the kids we recommend the Oral-B Advanced Power Kids Toothbrush or the Disney Princess Toothbrush. Dentists suggest that not only should we brush twice a day but also floss daily. Removing plaque between your teeth requires regular flossing at least once a day after brushing. There are two ways of doing this, either using an electric irrigator or floss picks. A wonderfully reliable and effective oral irrigator, the Panasonic EW1411 undergoes strict quality control and testing before the units are released from the factory. The unit sits neatly on the re charger base which can be placed on the bathroom counter top/shelf or wall-mounted if preferred. This product has been designed to give years of good service. Your Panasonic EW1411 is equipped with nozzle stand, a non-contact re-charger and Jet water nozzle rotates in every direction. There are some irrigators that are cheaper such as the Waterpik wp462 available for £45.00, another great product..
One Minute a day for a cleaner, fresher and healthier mouth! The Waterpik Water Flosser provides a unique combination of water pressure and pulsations to clean deep between teeth and below the gumline, removing harmful bacteria and debris than tradtional brushing and flossing can’t reach. It also massages and stimulates gums for enhanced circulation. * Rechargeable. NO batteries needed! Dual pressure control system – Low for sensitive gums. High for deep cleaning. We also love the Oral B Tooth Glide Floss Picks. 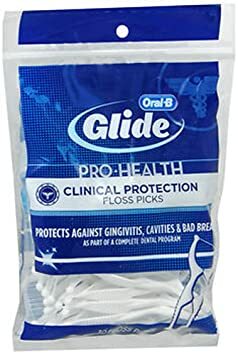 These floss picks are amazing, they are so easy to use. I always found it difficult to get to some of my teeth when flossing, also I seemed to cut off the circulation in my fingers using the standard wire floss! These Glide picks are my personal favourite. It’s an ingenious design which allows you to place the floss between the teeth at the right angle without any trouble. You can even adjust the tension in the floss by squeezing the special area of the handle. Take a look at HealthCare4All.co.uk for all your oral Hygiene needs!